Three Hitachi Z-HD6000 cameras at the ready for newscast production in James Madison University’s SMAD studio. James Madison University selected Hitachi Z‑HD6000 HDTV cameras as part a major upgrade and refresh of the equipment in its instructional television studio. The School of Media Arts and Design (SMAD) at James Madison University, a Virginia public institution, integrates traditional concepts, values, and skills with new and evolving technologies in its media education programs. 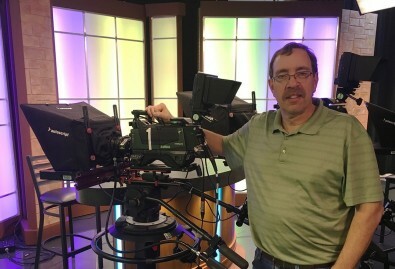 Three Hitachi Kokausai Z-HD6000s are deployed in the SMAD studio for hands-on instruction in a broad array of multiple-camera production disciplines, from media arts fundamentals to filmmaking and television news. Weekly newscasts produced as part of the university’s Broadcast Journalist curriculum are seen live on its on-campus, HD cable network and online, while select programs from SMAD’s Studio Production class including variety and talk shows are also seen on the school’s closed-circuit channel. Supplied by systems integrator Digital Video Group, the cameras are connected to HITACHI CU-HD500 camera control units (CCUs) using the studio’s SMPTE fiber infrastructure. John Hodges, technology manager for SMAD, points to the Z‑HD6000’s uncommonly rich array of built-in features – such as dual-channel communications, and prompter/floor monitor power and video at the camera head – as simplifying wiring while delivering additional benefits. “It’s so nice that we don’t have a bunch of extra cables hanging off the camera that the students could get tangled up in, or even just looking unsightly on the studio floor,” he noted. “As technology manager, I always try to keep up with what’s out there and what other users are saying, so I was aware that they were really good cameras,” he said. “I knew they would look great, so I had no hesitation whatsoever in switching to HITACHI cameras over our previous vendor, and they definitely did not disappoint. I’m just thrilled with the Z‑HD6000’s picture quality” remarked Hodges.